It is estimated that up to 50 percent of mobile ad clicks could be accidental. That, of course, is a major problem. The result is the artificial inflation of click-through rates and increased costs - neither of which will do at all! Google has long been a leader in correcting the problem, previously introducing "confirmed clicks" which prompts users to verify they meant to click on an ad and over the past year expanded those efforts to provide greater automation and require less work from users. Google is at it again though, announcing that it is now automatically blocking ad clicks in several instances that frequently lead to accidental clicks. 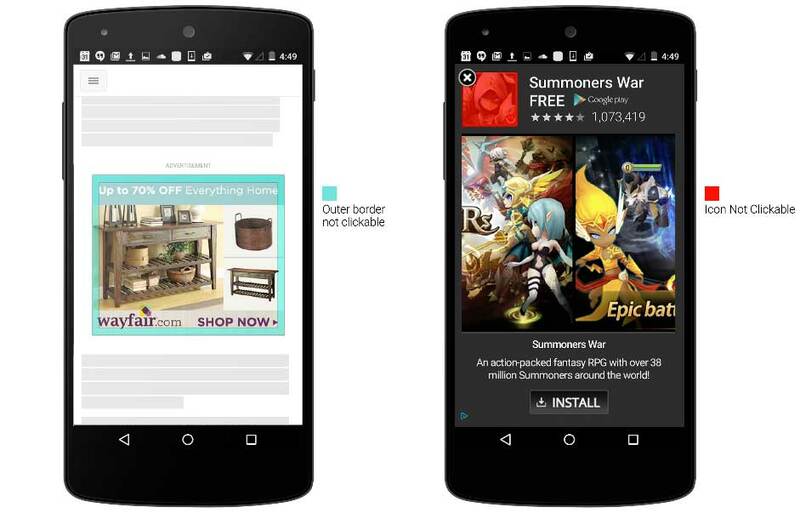 Google will be blocking clicks that happen close to the image edge (which are prone to accidental clicks), requires users to click on the call-to-action button to visit an app store page instead of the app icon (due to the proximity to the ad close button - see below), and adding a clickability delay. That last change is one of the most interesting. Ads will now only become clickable after they have been on screen for a short period of time according to Google, giving users enough time to examine the content. In its own tests of these click quality enhancements, Google saw a 15 percent average conversion rate lift on display ads.